Achieve the next degree of precision and personalization with Elekta software. 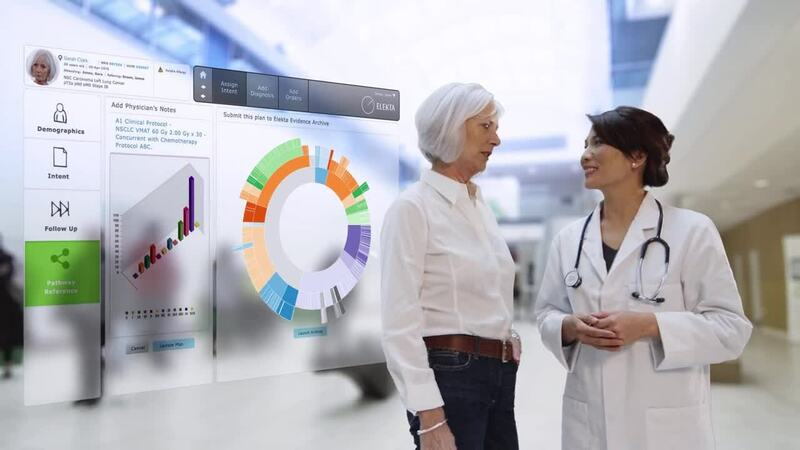 Elekta software brings together the people, the workflows, and the information clinics need to deliver quality care and run smooth operations. We are committed to delivering software that will help clinicians provide the best possible care—information-guided care—for every patient treated for cancer or a neurological disorder. The Elekta Care Management solution helps you turn advanced technology into advanced care—without the complexity. With unified radiation and medical oncology records, you see a more complete picture of your patients and their care pathways. Elekta provides a single source of clinical truth, accessible when and where you need it, so work can flow smoothly, clinical teams can make more informed decisions, and staff can efficiently manage day-to-day operations. Elekta Treatment Management software enables precision planning, continuous assessment and effective delivery of treatments—whether a patient is prescribed single-dose radiosurgery, brachytherapy, chemotherapy or a course of radiation therapy. Every one of your patients generates a new set of data from many different sources: Diagnostic and treatment information. Images and more images. Scheduling, billing, and personal records. It's big data—but it doesn't mean much if you can't put it to use. Elekta provides a single source of truth with the analytical tools to help you make faster, more confident decisions about your patients and your practice. Elekta's MOSAIQ® Oncology Information System has received certification from the Office of the National Coordinator for Health Information Technology (ONC-Health IT) 2015 Edition Health IT Module. The Drummond Group LLC, an Authorized Certification Body (ACB) empowered to test software for compliance based on requirements of the federal government’s program, issued the certification. The Certificate of Health IT Compliance designates that the software offers the functionality that enables eligible providers and hospitals to meet the requirements of various regulatory programs that require use of certified electronic health record (EHR) technology. MOSAIQ 2.70 meets the most up-to-date EHR requirements and offers the necessary technological capability, functionality, and security to help users meet the goals of the Promoting Interoperability program (formerly meaningful use) required by the Medicare as part of the Medicare Access and CHIP Reauthorization Act of 2015 (MACRA). The certification means that Elekta’s U.S. MOSAIQ 2.70 customers can avoid Medicare penalties and may also qualify for Medicare incentives under the Merit-Based Incentive Payment System (MIPS), a program that adjusts Medicare payments based on performance in four categories: quality, promoting interoperability, improvement activities and cost. To earn the certification, MOSAIQ was tested to be in accordance with applicable standards and certification criteria put forth by the Department of Health and Human Services (HHS).